The quality of our interior environment can have a huge impact on our health and well-being. Believe it or not, the choices we make when deciding how our home will look affects our perceptions, emotions and interactions with the outside world. According to mind-body research, our personal environment has been proven to influence our moods, impact our behavior and motivation to act, facilitate or discourage interactions, and create or reduce stress depending on the organization of the space and the specific objects included in the design. With the help of a few interior design tips, we can consciously manipulate decorative elements to encourage peace, comfort, creativity and happiness in our home that can then have a positive impact on our daily routines and the rest of our lives. The fact that colors can affect our mood is so deeply rooted in our moods that we use it in our vocabulary: we say we feel blue, we are green with envy or red with rage. When designing your home, it is crucial that you select a color palette to set the tone and mood of the room. According to color psychology, lighter colors will make a room feel more open, whereas darker shades will make a room feel more enclosed. The more white that is added to a hue, the more light is reflected in a room; on the other hand, the darker the hue, the more light is absorbed, which creates the feel of darkness. *Brown - feels calming as an accent color due to its association with wood, organic materials and stability. Be careful of overusing this color though, as brown can dull your senses and make you feel sleepy. Pair it with brighter accents to liven up the space. *White - represents purity and cleanliness. White can be elegant and open up a space when used in moderation and with pops of color as accents. When overused, white can be associated with sterility, like in a medical setting. For smaller rooms that you want to make feel larger, white is a great color choice. *Black - is usually not recommended in any room, except for maybe a home theater. Black is a powerful color that is best used in moderation and can serve as a grounding agent to balance out a lighter-colored room or to add an accent. *Grey - gives a sense of relaxation and serenity. Grey is best used in home offices or bathrooms. *Red - represents fire, love and anger. Red is the color of passion that can be used to warm up spaces and make them feel more intimate. Red can increase metabolism and blood pressure, and is a color that should be used sparingly in home decor and for a specific purpose. According to Feng Shui, red represents good fortune. *Pink - represents happiness, love and peace. For those who love red but don’t want to overwhelm a room, pink is a great calming alternative. Pink is also great for kids’ rooms and playrooms. *Orange - offers a jolt of energy, stimulation and innovation. Orange is best used as an accent since too much can leave people feeling overwhelmed. *Yellow - is associated happiness, creativity and creation. Yellow works best in combination with calming neutral shades and in rooms with lots of natural light to create a peaceful environment. *Blue - represents confidence, openness, freshness and stability. 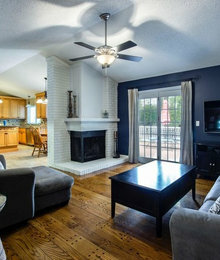 Since blue is calming, it is the most popular color for a living room. It is also a good fit for high traffic areas like bathrooms and kitchens. Make sure you avoid too much dark blue, as this shade can evoke feelings of sadness. *Purple - represents luxury, ambition, wealth and creativity. Depending on the shade, purple can be used for just about any room. It is a very versatile color and is a great choice for formal living rooms and master bedrooms, specifically, because it adds an air of sophistication. *Green - is known for its soothing qualities. Green is great for a foyer or entryway since it eases the transition from outdoors. The textures and shapes of the furniture and accent pieces in a house can help to produce emotional responses. According to Feng Shui, the shapes and textures of home decor should represent natural elements (e.g. earth, water, wood, metal and fire). For instance, the rich texture of a shaggy rug (like the one seen above) can enhance the sense of comfort and happiness, while the wooden elements (like the wooden side table and kitchen table in the background) are linked to personal growth and health. Decorative metal elements, like a wall clock, metal tray, or a vase will promote feelings of strength and independence. Overall, textures should be soft and touchable in restful areas (such as the living room), while they should be sharper and angular in areas of focus (such as a home office). The flow and layout of your home should be tailored to your lifestyle. For instance, if you entertain often, there should be a consistent and open flow from your kitchen, bar, dining room and formal living room to make entertaining easy and natural. An effortless flow between the rooms of your house will significantly diminish stress and improve the functionality of your space. Additionally, consider the concept of Perception of Space used by interior designers: visual tricks can be used to alter how a space appears. For instance, if you want a room in your house to appear larger, you can use furniture that is scaled to size and slimmer, place a large mirror on the back wall, and create depth with wall hangings (e.g. chandelier). On the other hand, if you are looking to make a large space appear more inviting, stick to a warm color palette, lots of intimate furniture groupings and offer plenty of ambient lighting. The ancient Chinese art of Feng Shui has been practiced worldwide for over 3,000 years. Those who adhere to the principles of Feng Shui believe that this practice can help attract good luck, success, love and positive energy. When you utilize the principles of Feng Shui, you can significantly reduce physical, mental and emotional stress to create the home environment of your dreams. Ultimately, the idea behind Feng Shui is that the furniture and items in the room should be organized in a way that allows energy to flow seamlessly throughout the room. The overall balance of the room should outweigh perfect symmetry of the items. *Maximize natural light - Though we can often feel limited by the number and placement of windows in our home, you can also mimic the look of natural light with LED lighting. *Declutter your home - This helps to remove distractions and improve the usefulness of your space. In turn, your own sense of productivity will improve. Make sure all spaces of your home are decluttered, but especially in your entryway and your main living space to ensure your home remains in good condition and is inviting to guests. *Use plants in living areas - The use of plants in living areas helps to improve air quality, inspiration, relaxation and focus. *Balance natural elements - Natural elements includes elements of fire, water, earth and metal. When you have a balance of these elements in your home, you can add interest and depth to your living areas. For example, utilize a fireplace, mirrors or curved furniture, plants or wood furniture and a metal side table to represent the different elements. *Create energy flow - Make sure there are no roadblocks in your pathways and all living areas are clean in order to encourage a productive and happy mood. *Inspirational home decor - Personalized home decor encourages your own personal goals, represents your internal thoughts and inspires you to achieve and remain positive. As mentioned above, the use of outdoor elements in your home can have a significant positive impact on your mood and overall sense of well-being. There are two main ways you can mimic the outdoors: utilize natural light and incorporate nature. Exposure to natural light is believed to keep our bodies in their natural circadian rhythms, keeping us alert during the day and relaxed at night. Additionally, natural light has been proven to increase our level of happiness. If you have the ability to add more or larger windows so that your home will be filled with outside light, you can create a more positive internal environment. Regarding incorporating nature, you can do this by including earth tones or textures, adding plants or adding water accents to your space. Plants help to purify the air, which can positively affect our immune systems and physical health. The additional nature elements will bring calmness and peace to your home environment, and can ultimately improve your health and well-being. *Function - Does this item fit your functional needs? For instance, when determining the function of an item in your interior design, consider its size, location in a specific room and possible uses. *Symbolism - Do you have an emotional attachment to the item? Examples of symbolic home decor items include personalized canvas prints (shown above), a collection of family photos or a meaningful painting. *Sign - Does the item hold status through its brand? With high customer satisfaction, high quality production and top-of-the-line materials, you can trust Canvas Vows to create your personalized canvas prints. This post was written by Kara Roberts, blogger and content writer for Canvas Vows. We specialize in creating custom made canvas prints and have been featured in a number of publications, including Brides. For more interior design tips, gift ideas, anniversary celebrations and personalized canvas creations, check out our blog!